Scott D. sent me this tip about a movie prop from the 1995 movie, Die Hard: with a Vengeance. The plot is eerily similar to that of The Lavender Hill Mob. This miniature Empire State Building was screen-used by Detective John McClane, played by Bruce Willis, in the alternate ending of Director John McTiernan's movie. 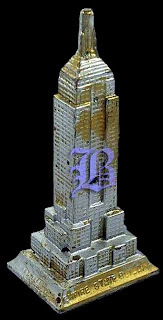 In the original script’s ending, Simon Gruber (Jeremy Irons) manages to escape and smuggles the gold out of the country by melting them into little Empire State Building miniatures painted in silver. The alternate ending is set a few years after the heist. John McClane (Bruce Willis) has been fired from the NYPD after more than 20 years in the force. He has even lost his pension due to the FBI's suspicion in his involvement with the heist. McClane finally manages to track Gruber down at his hideout in Nova Scotia and confronts him quietly inside a bar during the day. He tells Gruber about how he has figured everything out and takes out the Empire State Building miniature to show him. He then forces Gruber to play a Russian Roulette game called "McClane Says" with a Chinese grenade launcher that looks identical on both ends. Gruber loses and dies. This one-of-a-kind miniature is painted in silver with blotches of gold so that McClane can "scratch off" the paint to reveal the gold underneath.